It's Friday and I couldn't be happier. Well I could if I was off half day like normal. It's time for some Friday Favs and Happenings. One. After our children car mirror search, now I am trying to find sun shades for the girls' windows. We bought one blindly at Target the other day and it sucked, so it's going back there after work. The suction cups were bent and it wouldn't stick to the window. So much for Rory's idea on just picking the cheap one. Since I had some time to look at Target and Babies R Us online, I found a couple others that might work. I am thinking the static cling ones will be our best bet for now. Do you all have recommendations? I have to pick one up tonight since we leave to the Bay Area tomorrow. Nothing like waiting until the last minute. At least I get another Target run tonight. Two. I completed my first week back to running and it feels great. Sure, my legs feel dead, sore and on fire, but I live for that feeling. I can't wait to be able to run long distances again with ease. I also have been incorporating other leg exercises and weights into my routine to change it up. Seems like I need change in lots of areas in my life...exercise, meals and my closet. Three. The beach is calling my name. I saw a bunch of photos of friends at Lake Tahoe last weekend and I can't wait to go. Part of me wanted to take today off and head up there for half a day, but I need to save my vacation time for my upcoming vacation (which is 17 days away). But now I am trying to plan a beach day next week so I can soak up the sun and dip my feet in cold Tahoe. I.CAN'T.WAIT. Four. I want to make this or drink something like this this weekend. Cucumber Watermelon Rose Sangria. It has some of my favorite things in it...watermelon, sparkling wine, rose'. It seems like a lot of ingredients and work, but it would be the perfect drink for a summer party. Five. I am on the search again for a dress for another wedding I have next month. My old co-worker is getting married and I can't wait to celebrate with him and his bride-to-be. Lombard and Fifth didn't let me down with my dress last time, so I am trying to decide on a new dress from them. They always have new styles, so I might hold off for a bit, but these two I have my eye on. What do you think? I bought a random shade at Target when Cam was little and it was awful and didn't keep sun out at all. I love the blue dress! That's my vote. That sangria looks so good. I'm all about fun drinks with fruit. Ya, we stopped at Babies R Us last night to get another. Hoping it works and I will return the other one today to Target. I have the girls so hopefully they will behave and let me browse and shop a bit. I love the blue dress too and it will be pretty out where the wedding is. We got the tinted window cling for the babes window in the backseat. We also got her a pair of Babiators which are polarized and protect her eyes. I wish my girls would wear baby sunglasses. They hate them and rip them off in seconds. My back windows are tinted and it still bothers them. Hoping this new one that clings works better. Wow both of those dresses are gorgeous! I don't have any window shade recommendations, we never used those although I always wanted to! That drink looks delicious!! My girls cry when they are in the sun in the backseat. My windows are tinted, but they still get blasted with the sun. I love both dresses too! Loving both of those dresses! The beach has been calling my name as well! I need some time in the sun and water so much!! Hope you have a good trip this weekend!! Thank you. I love Tahoe so much and we took the girls up there a ton last year, and I hope they enjoy it even more this year. Hope you have a great weekend! We have the static cling mirrors made by Britax. We've had really good luck with them. We also got our boys Babiators when we're outside. They love them! That drink looks delicious! I am loving the blue dress! Hope you have a good weekend! Those are the ones I bought last night so that is great to hear. I might see if my girls like the babiators more than the other sunnies we go them. They didn't like those as much. Have a good weekend as well! Thank you. I think the blue dresss would be perfect for this summer time wedding out in the country! Yes it does. I wish there was a more simply way of making it though. I'm so looking forward to a beach day! Wouldn't mind some of that sangria right about now. Have a great weekend. It's only June 3rd and the beach is definitely calling my name. Hope you have a great weekend! Hooray for being back into running! Starting back after not doing it for a while is tough but so worth it...I'm doing the same thing right now. It is super tough and my body hurts, but you are right, it is worth it. How long have you been running? Good for you for running!!!! I have tried to start running so many times and I just fail each time. I need some really good motivation.. which I can't seem to find. I love the bottom dress, the one with the full skirt!! So pretty. Have a great weekend!!! I had started after my knee surgery and loved it. It got me in the best shape of my life for my wedding. I was long, lean and loved my body. Then I had to stop in October when I was pregnant with the girls. I have been motivated to do it again and it is hard, but worth it. My legs are sooooo sore. I completed week one though and I can't wait to keep going. I love the full skirt too! Have a great weekend as well! Yes it does. I love all the ingredients! Have a great weekend as well. Both of those dresses are beautiful but I think I like the black and white one the best! It is stunning and you would look amazing in it! It is very beautiful. It comes in white and blue too. I love the full skirt on it. Just getting the cheapest one is always my husband's solution as well, whereas I like to research the crap out of every purchase big or small to make sure we love everything we own and don't end up just wasting money by replacing it. The dresses are gorgeous. Completely how I feel and how I work. I can't wait to pick out a dress for this wedding. Give me all the sangria! That recipe looks delicious! That is how I feel as well! I love the light blue dress, so pretty! My friend chose that color for her bridesmaid dresses. We wanted to go to the beach this weekend but it doesn't look like the weather's going to turn out to be as nice as we had hoped. We've been having a stormy week. Enjoy that sangria, looks delicious! It is a very pretty blue. We had amazing weather, but we were out of town, so I am hoping we can go this weekend. I need the sun, a tan and some sand between my toes. Oh my gosh - that sangria looks ah-mazing! Yes it does. Let me know if you make it. Yay for another target trip (bonus points if it's sans kids)! And that sangria looks amazing! Ahhh that sangria! So yummy. Someone made some at our neighborhood BBQ this weekend and I'm so bummed I didn't try any. I had my wine though, haha. Oh you should have. That is awesome that you guys have neighborhood BBQs. I wish my neighborhood did that. At least you got your wine! We have these sun shades and love them. We'll be ordering more for baby #2 for sure. http://www.amazon.com/Britax-EZ-Cling-Shades-Black-Count/dp/B006ZVV0NO. 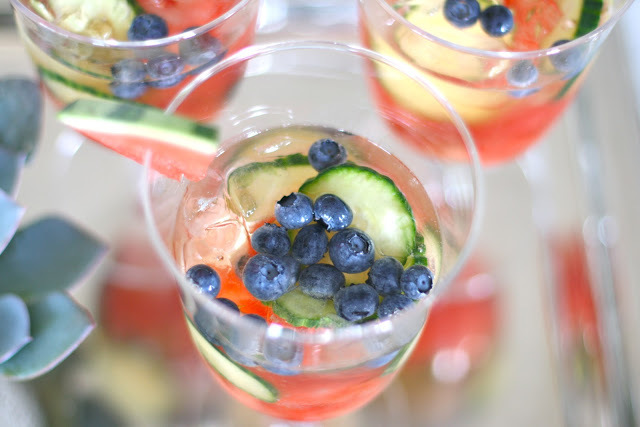 That cucumber watermelon rose sangria sounds amazing! I love both dresses but I think I'm leaning toward the second one! Haha, those are the ones that we just bought on Friday. So far they worked all weekend and kept the sun out.